Do not leave a severely impaired person with Alzheimer’s alone in the bathroom. Remove the lock from the bathroom door to prevent the person with Alzheimer’s from getting locked inside. Place nonskid adhesive strips, decals, or mats in the tub and shower. If the bathroom is uncarpeted, consider placing these strips next to the tub, toilet, and sink. Use washable wall-to-wall bathroom carpeting to prevent slipping on wet tile floors. Use a raised toilet seat with handrails, or install grab bars beside the toilet. Install grab bars in the tub/shower. 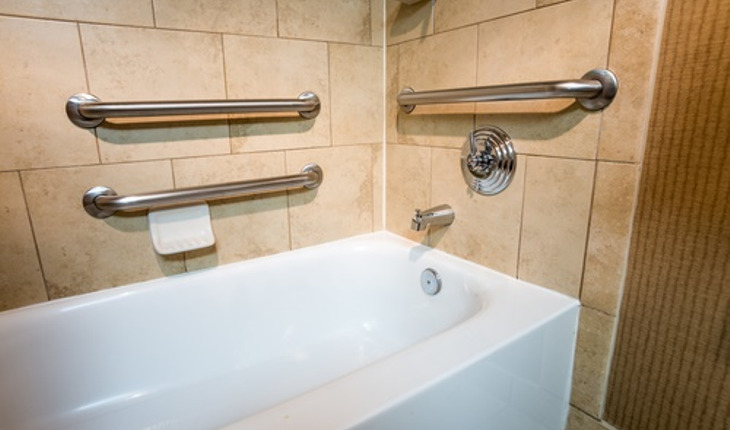 A grab bar in contrasting color to the wall is easier to see. Use a foam rubber faucet cover (often used for small children) in the tub to prevent serious injury should the person with Alzheimer’s fall. Use a plastic shower stool and a hand-held shower head to make bathing easier. In the shower, tub, and sink, use a single faucet that mixes hot and cold water to avoid burns. Set the water heater at 120 degrees Fahrenheit to avoid scalding tap water. Insert drain traps in sinks to catch small items that may be lost or flushed down the drain. Store medications (prescription and nonprescription) in a locked cabinet. Check medication dates and throw away outdated medications. Remove cleaning products from under the sink, or lock them away. Remove small electrical appliances from the bathroom. Cover electrical outlets. If a man with Alzheimer’s disease uses an electric razor, have him use a mirror outside the bathroom to avoid water contact. Reprinted courtesy of the National Institute on Aging. For more on home safety for people with Alzheimer’s, click here.